Objectives: the current study aimed to assess the potential prognostic role of role of C reactive protein (CRP) and erythrocyte sedimentation rate (ESR) in advanced stage bladder cancer. Patients and Methods: forty six patients with advanced bladder cancer were included in the study. After consent, CRP and ESR were measured before treatment, after 2 cycles of chemotherapy and at the end of treatment. The relation between CRP and ESR serum measurements and patients' data features and treatment response were assessed. Results: among patients included in the study both CRP and ESR were found elevated in all the included patients with mean values± standard deviation: 35.43 ± 12.65 and 57.17 ± 18.15 respectively. The baseline CRP levels were higher in patients with metastatic disease, ESR had statistically significant relation with squamous cell carcinoma pathology, hydro-nephrosis, and also it was significantly elevated in patients who died within one year of diagnosis (P value: 0.003, 0.001 and 0.03 respectively). 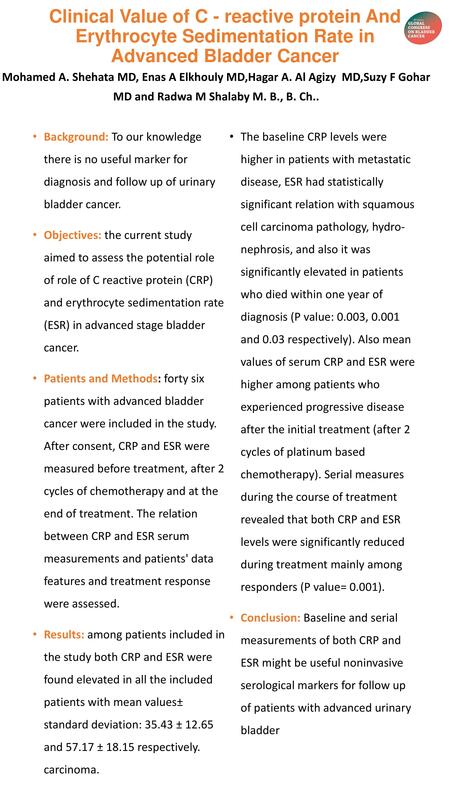 Also mean values of serum CRP and ESR were higher among patients who experienced progressive disease after the initial treatment (after 2 cycles of platinum based chemotherapy). Serial measures during the course of treatment revealed that both CRP and ESR levels were significantly reduced during treatment mainly among responders (P value= 0.001). Conclusion: Baseline and serial measurements of both CRP and ESR might be useful noninvasive biomarkers for response in patients with advanced urinary bladder carcinoma.